Dennis McQuillen is a graduate and scholarship student of The School of the Museum of Fine Arts, Boston, where he studied painting under Henry Schwartz and Lionel Feininger. Upon graduation, he received a scholarship for a summer-long residency at Haystack Mountain School of Crafts in Maine. Throughout his fine art career, he continued his studies at Massachusetts College of Art with artists and teachers such as Janet Monifo, Paul Rahilly, and Ed Stitt. He has also studied privately with Stapelton Kearns, David Curtis, and George Nick. McQuillen recently had a solo show at the Concord Art Association, and has participated in group shows at Newton Open Studios. Since 2006, has been included in the Annual Juried Newburyport Art Association Show. 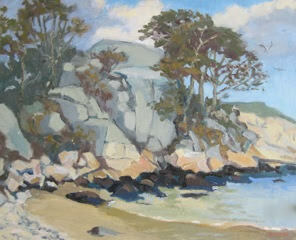 He is a member of Concord Art Association, Newburyport Art Association, and the Malden Sketch Group. He maintains a studio at his home in Massachusetts.